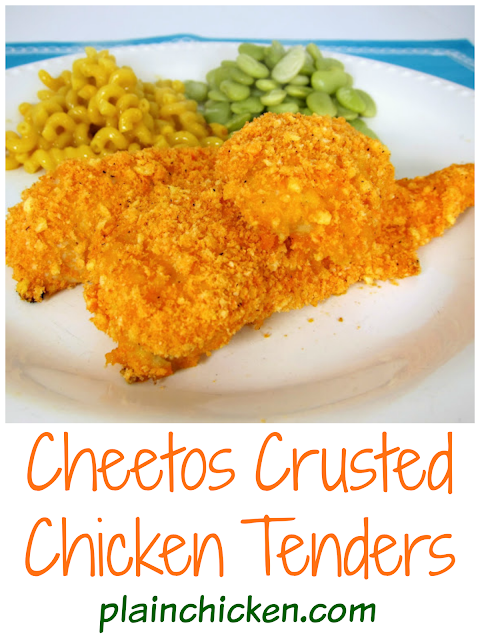 Cheetos Crusted Chicken Tenders - chicken tenders coated in Cheetos and baked - SO yummy! Kids gobble these up! A little while back we made some awesome Cheez-It Chicken Fingers. They were so good! I started thinking about what other snack foods that would be good on chicken fingers. I had a bag of Cheetos in the pantry, and I thought I'd give them a try. These chicken fingers were really good. They are everything you love about Cheetos, but without the orange fingers! I used Baked Cheetos, because that is what I had in the pantry. I think these would be even better with regular Cheetos. This was a fun dish. I think kids would really love this - who doesn't want to eat Cheetos for dinner?! Put rack in lower third of oven; preheat to 475°F. Line a baking pan with nonstick aluminum foil. Pulse Cheetos in a food processor. Transfer to a bowl; stir in pepper. Toss tenders in honey mustard dressing, then dredge in crumbs. Arrange on pan. Spray tenders with cooking spray. Bake, turning once, until golden brown, 15 minutes. I never would have thought of this! Definitely going to try this recipe. Great and easy recipe. Thanks for posting. Are you serious? This is like my dream come true-- i LOVE cheetos! These look awesome. I made this tonight and it was AMAZING!!!! I mixed some sour cream, melted butter and hot chili oil in with the mustard. I also used some pretzels as well because I didn't have enough cheetos. After two bites, my kiddo requested this once a week for dinner! Thanks for sharing! I'd like the recipe for the mac and cheese on the plate please! Beverly - the mac & cheese is a Knorr side. It is the bacon mac & cheese - quick and easy! I made this tonight....it did not turn out. So sad. Is the oven temp correct? Mine did not coat pretty like yours. Altered Orange - oh no! Did you use honey mustard salad dressing? I did cook them at 475, but every oven is different. Try cooking them at a lower temp - maybe 425 or 450 will do better. I also use the non-stick aluminum foil - the coating doesn't stick to it. Cheetos for dinner! I'm in :) Sounds super. I've made this and it was great! I have also used the cooking time for any of my chicken tender recipes and it's perfect. I have been cooking mine at 350 for 25 minutes for years and they always came out dry. Thanks for the recipe! No Cheetos on hand tonight so I used Doritos. I got a "Love it" from the 4-year-old! YES!